Ibis Styles Nice Vieux Port is in the old port area of Nice, just over half a mile from the Acropolis Convention Centre. It features free Wi-Fi and on-site parking. All of the rooms at ibis Styles Nice Vieux Port are stylishly decorated and equipped with air-conditioning, satellite TV and anti-stress pillows and comforters. Rooms have a private bathroom with shower. All of the rooms are serviced by an elevator. A buffet breakfast is served daily at the hotel. Free water and hot beverages are also available in the lobby area. The tea and coffee served at All Seasons Nice Vieux Port is fair trade. The front desk is open 24 hours a day. Complimentary newspapers are available. Ibis Styles Nice Vieux Port can be easily accessed from the A8 highway. Its located 8.4 miles from Nice Airport and 1.5 miles from Nice Ville train station. The hotel is within walking distance of Nice Cathedral and Castel Plage. 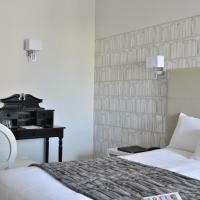 In Nice, Nice Fleurs Apart'hotel is a 5 minute walk from the Promenade des Anglais and the beach. The soundproof studios and apartments are set around a Mediterranean garden. All apartments at Nice Fleurs Apart'hotel are serviced by elevators and equipped with a flat-screen TV. Apartments also have private bathrooms and a kitchen. Some apartments offer a view of the grounds. Nice Airport is only 4 miles from Nice Fleurs Apart'hotel and private parking is available on site. Guests can access free Wi-Fi in the lobby and in the courtyard. In the heart of Nice, Best Western Roosevelt is just a 5-minute walk from the Promenade des Anglais. It has a 24-hour front desk and is only a 3-minute walk from the pedestrian area where guests can find shops and restaurants. The soundproof and modern guest rooms at Best Western Roosevelt Nice have a flat-screen TV and a mini fridge. Rooms are air-conditioned and include free W-Fi access. Each room also has tea and coffee-making facilities. The hotel serves a continental buffet breakfast of pastries, cold meats and juice in the breakfast room. Coffee and tea is available free of charge throughout the day after 10:30 am. Games and books are available for guest use. Best Western Roosevelt Nice has a computer with free Wi-Fi access in the Business Centre, and also has a meeting room. 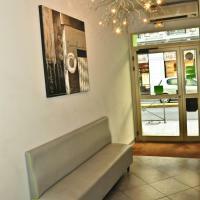 The hotel can also be accessed from Nice Train Station, 7 minutes away. Nice Airport is 4 miles away. The Excelsior Hotel, built in 1898 in the tradition and comfort of Belle Epoque, offers you a warm welcome and a casual atmosphere. By choosing the Excelsior Hotel, you will be in the historic center of Nice, which opens out tothe Mediterranean Sea; you'll be just a few steps from the beautiful beaches and the famous Promenade des Anglais. Nearby you will find shops, the convention center, the market hall, plenty of lovely restaurants, bars and clubs, a casino, and various museums. The Excelsior features comfortable rooms entirely renovated to provide you with a relaxing living space throughout your stay. All are stylish and equipped with modern private bathrooms. The lovely and peaceful garden is available for a relaxing moment or an outdoor breakfast. Whatever your reason for visiting Nice, the Excelsior Hotel provides everything you need for a truly, enjoyable stay. Les Palmiers residence is on private grounds full of palm trees in the quiet district of Fabron. It features apartments with a balcony just half a mile from the beach. The Résidence Pierre & Vacances Nice Les Palmiers has air-conditioned apartments featuring a kitchenette with a dishwasher, a microwave and a refrigerator. Every apartment includes a balcony or terrace and a private bathroom. There also is a deck and a seasonal outdoor swimming pool as well as a game room. The Résidence Pierre & Vacances Nice Les Palmiers is just over a quarter mile from stores and 2.5 miles from the old harbor. Nice Côte d’Azur Airport is 3.5 miles from the property. The Adagio Nice Promenade des anglais is on the Promenade des Anglais. This beachfront, apartment-style hotel has air-conditioned accommodations with sea or city views and free Wi-Fi internet access. The soundproof accommodations at the Nice Excellior have satellite TV, private bathrooms and a private balcony or terrace. The apartments also include a sitting area and a kitchenette equipped with a microwave and dishwasher. A buffet breakfast is served everyday. Adagio Nice Promenade des anglais also provides a 24-hour front desk with a tour desk and a currency exchange service. Adagio Nice Promenade des anglais is a 10-minute drive from Nice Train Station and the Old Town. Nice-Cote d’Azur Airport is just 3 miles away. This hotel in Nice features an outdoor pool with a furnished terrace. It is 3.5 miles from the beaches of Saint-Laurent-du-Var and 5 miles from the Promenade des Anglais. Place Massena is 8 miles away. 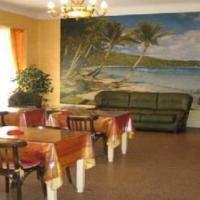 Servotel Nice Saint Isidore features air-conditioned and soundproof rooms with modern décor and a balcony. They come equipped with a flat-screen TV with cable channels, a minibar with 1 free soft drink, and they have a private bathroom. It is recommended that guests have a car and staying at the hotel. A buffet breakfast and innovative cuisine inspired by the regional specialties are prepared at the Le Saint Joseph restaurant. Meals are served in the classy dining area or on the covered terrace. Guests can enjoy a drink at the hotel’s bar. The hotel is close to the A8 highway and 10 minutes from Nice Airport. Free Wi-Fi access is provided and free private parking is available on site. Right on the Promenade des Anglais, this hotel faces the Mediterranean Sea. It is a few steps from the Old Town and features a panoramic rooftop terrace and an outdoor swimming pool. Beauty treatments and massages can also be arranged for an extra fee. The modern guest rooms at Le Meridien Nice have views of the sea, the Albert 1st Gardens, or the hotel patio. Each is air-conditioned and includes a mini-bar and satellite TV, and most also feature a balcony. From the hotel's restaurant on the rooftop terrace, guests will enjoy panoramic sea views of the Baie des Anges. Breakfast can be enjoyed every morning in a dining room with sea views. Guests of Le Meridien Nice can sunbathe on the Ruhl private beach, in front of the hotel. The hotel also has a fitness center. Nice-Côte d'Azur Airport is 5 miles away, and Nice train station is just over half a mile from the property. Situated in Nice, facing the fountains of the Albert 1er grounds, the Hotel Acanthe offers rooms with private bathrooms with TV and free Wi-Fi internet access in its public areas. All of the rooms are serviced by an elevator, and some rooms offer a view of the grounds. Breakfast is served daily at the Hotel Acanthe and can be enjoyed in your room upon request. The historic quarter of Nice with its pedestrian area offers typical restaurants and boutiques. The beach is only 219 yards away, just across the Promenade des Anglais. The Adagio Access Nice Magnan is a 2-minute walk from the Promenade des Anglais. It features an outdoor swimming pool and air-conditioned apartments distributed across 7 floors. All the apartments and studios are fully equipped with a kitchenette, a bathroom with shower, and a TV. The Adagio Access Nice Magnan provides free Wi-Fi, laundry facilities and a 24-hour front desk. A breakfast buffet is served daily. The residence is less than a 10-minute drive from Nice-Cote d'Azur Airport and 2 miles from Nice Centre SNCF Train Station. Just over half a mile from the Promenade des Anglais, Adagio Access Nice Acropolis is ideally located for exploring Nice. It has apartments and studios with a kitchenette and a rooftop swimming pool. The accommodations at the Adagio Nice Acropolis feature a TV with satellite channels and a work desk. Each has a private bathroom and is serviced by an elevator. A buffet breakfast is served every day in the bright breakfast room for an additional fee. Alternatively, meals can be prepared in the apartments’ kitchenette, which has a microwave and kitchenware. Adagio Nice Acropolis is within walking distance of Acropolis, the Museum of Modern Art, the Port, the Old Town and a tram stop. Nice-Cote d’Azur Airport is 5.5 miles away. Parking is conveniently available on site and Wi-Fi is free throughout the residence. This hotel is in a 19th-century building in central Nice and features a tropical garden with a swimming pool. The hotel’s fitness and spa center features a steam bath, a sauna and massage treatments. Each air-conditioned and soundproof room is uniquely designed and most have contemporary art. They include free Wi-Fi, satellite TV and private bathroom. The larger rooms have a balcony or balnéo bath. Hotel Windsor offers traditional cuisine and buffet breakfast served in the classy dining area or outside. Guests can enjoy a drink at the lounge bar, and during the winter they can relax near the fireplace. Hotel Windsor is just over a quarter mile from the beach and the Promenades des Anglais, and just over half a mile from the Vieille Ville de Nice. Gare de Nice-Ville Train Station is half a mile away. This hotel is in central Nice, a 10 minute walk from the Promenade des Anglais and the beach and just over a quarter mile from Gare de Nice-Ville SNCF Train station. It features air-conditioned and soundproof rooms. Each stylish room at the Saint Georges Nice features views of the grounds, free Wi-Fi, satellite channels on a flat-screen TV and a private bathroom. All rooms are accessible with an elevator. A continental breakfast is served daily in the breakfast room. Guests can enjoy a relaxing afternoon drinks in the lounge or in the Saint Georges Nice’s garden. Surrounded by boutiques and only a 10 minute walk from the historic quarter, which is also accessible by tram with Jean Médecin Tram Stop just 150 yards from the hotel. Notre-Dame de Nice is 220 yards from the Saint Georges. This 4-star resort sits in the center of Nice, just 260 yards from the Promenade des Anglais. It features a rooftop heated pool with solarium. The Goldstar Resort and Suites has spacious soundproof suites with modern design. Each air-conditioned room has a flat-screen TV with satellite channels. Some rooms have a luxurious living room and a kitchenette. Free Wi-Fi access is available throughout the entire hotel. For your comfort and wellness, the Goldstar's Thalassotel spa offers a wide range of and beauty and body treatments by Terrake. Treatment specialists are available everyday from 8 am to 8 pm. Guests at the Goldstar Resort have access to the sauna, and fitness center. They can have a drink at the rooftop bar and enjoying a panoramic view of old Nice. Just under a quarter of a mile from the beach, the Goldstar is an ideal base to explore the French Riviera. There is shuttle service available for an additional fee to Nice-Côte d’Azur Airport, 3 miles away. This lovely boutique hotel is ideally in the heart of Nice, just 490 yards from the famous Promenade des Anglais and the beach. It offers free Wi-Fi access. It is a 15 minute walk from the Old Nice. The soundproof rooms at La Malmaison are all air conditioned and feature large French windows. Each room comes equipped with a flat-screen TV that has satellite channels and a private bathroom with a bathtub and a shower. A buffet breakfast is served daily in the communal lounge. The hotel’s lounge bar is open throughout the day. It has a large flat-screen TV and free Wi-Fi access. The staff is available 24 hours to assist guests with local tours and excursions around Nice. La Malmaison is 710 yards from the Nice train station. This Mercure Hotel is located in Nice on the Promenade des Anglais. This sea front hotel is less than half a mile from Old Nice and offers soundproofed accommodations with free Wi-Fi. Each guest room at the Mercure Nice Promenade Des Anglais is air conditioned and equipped with a minibar and a flat-screen TV with satellite channels. The private bathrooms have either a bathtub or shower. Some rooms also have balconies and sea views. Breakfast is served daily at the hotel and can be enjoyed by guests in their room upon request. The hotel offers a 24-hour front desk. The beach is just a 2-minute walk from the Nice Promenade Des Anglais Mercure Hotel. The hotel is located one mile from Nice train station and 4 miles from Nice International Airport. Nice Acropolis Convention Center is 1.5 miles away. Located across from Nice-Côte d'Azur Airport, this soundproof hotel is 3.5 miles from central Nice. It features free Wi-Fi access and a free airport shuttle service is available 24 hours a day. This property is a non-smoking accommodations and all air-conditioned guest rooms feature a TV and a queen bed. It has a bright 8,073 ft² lounge area that can be arranged for different purposes. A breakfast buffet is served every morning and the Novotel Café serves French cuisine for lunch and dinner. Guests can enjoy a drink in the open-plan bar. The Hotel Novotel Nice Arenas Aeroport is set on the famous Promenade des Anglais and is a 5-minute walk from Phoenix Park. Cannes is 17 miles away and Monaco is 20 miles away. Private parking is available on site. The Mercure Nice Grimaldi is ideally in the center of the city’s pedestrian zone, just 330 yards from the famous Promenade des Anglais. It offers a top-floor sun room with a panoramic view. This Mercure hotel offers air-conditioned rooms, all equipped with modern private bathrooms, satellite TV and free Wi-Fi internet access. All rooms are serviced by an elevator. An buffet breakfast is served daily at the Nice Grimaldi. The hotel’s front desk is open 24-hours a day. Additional services include a tourist information desk and luggage storage. The hotel is half a mile from Nice’s Train Station and 4 miles from Nice Airport. Vieux Nice is a 10 minute walk away and public beaches are just 5 minutes from the hotel. Located in the center of the city of Nice and right across from the Acropolis International Convention Center, Novotel Nice Centre offers air conditioned rooms and an outdoor swimming pool with a panoramic view. 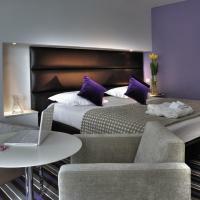 Novotel Nice Centre rooms have a contemporary décor and feature a private bathroom, a flat-screen TV and a desk. There is a minibar and tea and coffee making facilities. Free Wi-Fi is available in all rooms. Guests have a choice of 4 types of breakfast served daily at the hotel. Guests can also enjoy a drink or snack in the hotel’s bar or French cuisine in the Novotel Café restaurant. Nice Airport is 5 miles from this Novotel. The hotel is serviced by Palais des Expo tram stop right across from. Old Nice is one mile away and the Chagall Museum is a 20-minute walk from the hotel. Hotel Parisien is in the heart of Nice, a 15 minute walk from the beach and a 5 minute walk from the train station. Decorated in red tones, the rooms include air conditioning and a TV. They also have free Wi-Fi access and a private bathroom, complete with a shower. Buffet breakfast is served every morning in the breakfast room. You can also choose to enjoy breakfast continental-style in the comfort of your guest room. Additional facilities at this hotel include a fridge at the front desk, where you can buy cold drinks. Centrally located, the Hotel Star is just a 10 minute walk from the historic quarter and the beaches. It is surrounded by restaurants, shopping and activities. Free Wi-Fi is available throughout the hotel. Hotel Star offers 24 soundproof and air-conditioned rooms with flat-screen cable TV and bathtub or shower. Some of the rooms have a small balcony. Baby equipment is available upon request. Hotel Star is open 24-hours a day and serves a daily breakfast. There is also a computer in the lobby with free Wi-Fi internet access. The Hotel Star is centrally located with the Baie des Anges, Old Town Nice and the Promenade des Anglais all within a short walk. Public transportation and parking is only 100 yards away. This 4-star hotel features a rooftop swimming pool with panoramic views of central Nice. It has a spacious interior courtyard and a shaded terrace. A satellite TV and a minibar are standard in each air conditioned room. Guest rooms have a modern décor and views of the exotic grounds or the city. The private bathrooms include a hairdryer. Enjoy cocktails on the rooftop bar, Plein Ciel at hotel Mercure Centre Notre Dame. Breakfast is served every morning in the spacious breakfast room. With a 24-hour front desk, Mercure Centre Notre Dame Nice also has a tour desk and car rental. Free Wi-Fi is available in public areas. Nice-Ville Train Station is less than half a mile from the hotel and the Promenade des Anglais is a 15-minute walk away. NH Nice is just a 10-minute walk from the historic quarter and the Port. It features 4-star accommodations, free Wi-Fi and a rooftop swimming pool and terrace, right next to the Acropolis. Rooms at NH Nice are contemporary in style and have an LCD TV and a minibar. Each is air-conditioned and has a private bathroom. All rooms are serviced by the hotel’s elevator. A breakfast is available every morning and Le Nhice Lounge restaurant serves Mediterranean cuisine. The hotel bar prepares cocktails that can be enjoyed on the terrace, overlooking Nice’s rooftops. Additional facilities include a fitness center and babysitting services. The hotel also has a sauna, a solarium and Wi-Fi access in guest rooms and public areas. NH Nice is a 5-minute drive from the highway A8 and private parking is available at the hotel. Monte-Carlo is 20 minutes away by car. H33 is a 10 minute walk from Nice’s Promenade des Anglais and Castel Beach. It offers air-conditioned rooms with a flat-screen TV and free Wi-Fi access. Rooms at H33 are brightly decorated and each has a safe, a work desk and a private bathroom with a hairdryer. The hotel serves breakfast everyday and provides a currency exchange service at the front desk. The tour desk can help guests to book tickets or plan their days in the Cote d’Azur region. The hotel is just over a quarter mile from the Train Station and a 10 minute walk from Place Massena and Vieux Nice. Located in a quiet street in Nice City Centre, this hotel is 240 metres from Nice-Ville Train Station. It has a 24-hour reception and satellite TV is included in the guest room. Each room has a simple décor with a work desk and a telephone. Most of the rooms feature a private bathroom. All of the rooms are serviced by a lift. Enjoy a continental breakfast every morning while reading the newspapers provided at Hôtel D'Orsay. After breakfast, guests can relax in the lounge. The Promenade des Anglais is a 15-minute walk from the Orsay hotel. The old town with its flower market and traditional restaurants is 2 km away. The stylish beach front hotel is ideally located on the Promenade des Anglais, just over a quarter mile from the Vieux-Nice district and 1.5 miles from the Acropolis Congress Centre. It features air-conditioned accommodations with satellite TV, some overlooking the Mediterranean Sea. Guests can choose from soundproof rooms and suites, all equipped with a minibar and a spacious bathroom with a bathtub. Some have a balcony. The West End’s restaurant, Le Siecle, serves traditional Mediterranean cuisine. During the summer, the breakfast and lunch buffets are served in La Palmeraie, and both restaurants have sea views. Guests can also enjoy breakfast in the comfort of their room, for an extra fee. The airport shuttle bus #98 stops at the Gambetta/Promenade station, situated in front of the Hotel West End Promenade des Anglais. Access to the private beach across from the hotel is available for an additional fee. Nice Côte d'Azur Airport is 4 miles away. The Royal Hotel is on the Promenade des Anglais and only 3 miles from the airport. In a historic building just 2 minutes from Old Nice, this hotel has air-conditioned rooms and a terrace bar overlooking the sea. Each classically decorated and spacious room comes equipped with a TV and a private bathroom. Some rooms have a balcony with views of the sea. A breakfast buffet is served daily and Hotel Royal’s restaurant serves traditional and regional French cuisine. You can enjoy your meals on one of the hotel's terraces. Free Wi-Fi, discounted taxi rates, tickets and excursions are available at the 24-hour front desk. Le Meurice is in the center of Nice just a 5-minute walk from the Promenade des Anglais, the beach and Place Masséna. It features individually decorated rooms and free Wi-Fi. The stylish and spacious rooms at Le Meurice have individually decorated living spaces in both Art Deco and Belle Epoque styles. They also have modern private bathrooms A sweet and savory buffet breakfast is served every morning in the breakfast room. The hotel is a 10-minute walk from the Cours Saleya Market and Old Nice. Le Meurice is in a great location near the casino, convention center and pedestrian streets filled with shops, cinemas and restaurants. It is a 15-minute walk from Nice Train Station and 4 miles from Nice Airport. The airport is accessible by bus which stops 165 ft from the property. In central Nice, a 5-minute walk from the beach and Nices’ Old Town, Clarion Hotel Aston features a rooftop terrace with seasonal outdoor pool, bar and views of the Old Town. It is just 650 ft from Place Massena. Each air-conditioned and soundproof room is individually decorated. They come equipped with free Wi-Fi and a flat-screen TV with cable channels. Some rooms have a private balcony and overlook the Old Town. A buffet breakfast and regional cuisine is served at the L’Horloge restaurant or on the terrace. Guests can enjoy a drink at the Le Seven Blue bar with views of the Mediterranean coastline. Facing the future tree-lined walkway, Clarion Hotel Aston Nice is a short walk from the Quai des Etats Unis and from the Promenade des Anglais. Gare de Nice-Ville is an 18-minute walk away. Facing the Baie des Anges, the Mercure Nice Marché Aux Fleurs is in an easily accessible building. Centrally located in the Old Town next to the flower market, the tram is just a few feet away and Nice International Airport is 5.5 miles away. This Niçois hotel has free Wi-Fi access in all of the rooms. Rooms are air-conditioned and some have views of the Old Town. Fresh bread and fruit is served every morning for breakfast and room service is also available. Before dining in nearby restaurants, guests can relax and watch the LCD TV in the hotel's bar Le Baryton. Covered parking is available at a location nearby. Bicycle rental can be arranged at the 24-hour front desk, and mini buses are also available for visiting the surrounding towns. This hotel is located in the heart of Nice, only 2 minutes from Place Massena and the famous Promenade des Anglais, and a few minutes by tram from the Acropolis conference center. Each air conditioned and soundproofed room at the Hôtel Univers features a flat-screen satellite TV, free Wi-Fi access and a private bathroom. The hotel serves a buffet breakfast daily. There is a vending machine with cold drinks on the second floor and a lounge with a TV for guests to relax in. Hôtel Univers is only a 5-minute walk from the old Nice town with its famous flower market, it is also close by to Casino Ruhl, Nice Étoile Shopping Center and the beach. This hotel is located in the historic center of Nice, just 110 yards from the beach and the Promenade des Anglais. It offers rooms with flat-screen TVs and free Wi-Fi. Most of the guest rooms at the Villa Rivoli have a balcony and a view of the grounds and the surrounding area. The Rivoli serves a buffet breakfast, which can be enjoyed in the breakfast room or in the comfort of the guest rooms. For guests coming by car, parking is available upon reservation. This 19-century hotel, combining charm and modern comfort, is in the center of town a few minutes from the beaches, the old city and its flower market as well as the Palais des Congrès. All of the rooms are air-conditioned and feature a TV with cable channels, a safe and a minibar. The private bathroom includes a hairdryer and free toiletries. A buffet breakfast is served every morning at Hôtel Vendôme and it is also possible to eat breakfast in the comfort of your guest room. Additional features include free Wi-Fi access, luggage storage and a 24-hour front desk. Private parking is available on site. Set on the Promenade des Anglais, this Art Deco-style hotel features an on-site casino, an indoor-outdoor swimming pool, hammam and sauna. The terrace offers panoramic views of the Baie des Anges. Free Wi-Fi, a minibar and an LCD TV are provided in the air-conditioned guest rooms. Most of the elegant rooms have a furnished terrace with views of the sea or of the town. Regional cuisine and Mediterranean dishes are served in the hotel restaurant, Le 3e. You can enjoy drinks in the Lounge Bar Le 3e at Hyatt Regency Nice Palais de la Méditerranée. The fitness center at the Hyatt Regency Nice Palais de la Méditerranée has cardio-training gym equipment. Nice Train Station is a 5-minute walk away. Nice-Cote d’Azur Airport is just 4 miles away. Just under half a mile from the Promenade des Anglais, Le Palais Rossini is about half a mile from Place Massena. It has self-catering suites, studios and duplex apartments with air conditioning and a flat-screen TV. The suites, studios and apartments at Le Palais Rossini feature free internet access, and a a bathroom with a bathtub or shower, and free toiletries. A kitchenette with electric hubs, a refrigerator, microwave and dishwasher are also provided in the accommodations. Le Palais Rossini's furnished apartments can be rented for short or long periods. The residence also features a breakfast room, baby equipment rental and laundry facilities. It is 1.5 miles from the Acropolis convention and exhibition center. The Park Inn by Radisson Nice is one mile from the Promenade des Anglais and half a mile from Nice Côte d’Azur Airport. It has a seasonal outdoor pool and hot tub and offers free access to the sauna, hammam and fitness room. The 4-star Park Inn provides air-conditioned guest rooms, each with a private bathroom, flat-screen satellite TV and Wi-Fi access. Guests of the Park Inn Nice can enjoy Mediterranean cuisine in the hotel’s 2 restaurants. Dishes can also be ordered to your guest room. The Park Inn Nice offers a complimentary shuttle to St. Laurent du Var Marina and the Cap 3000 shopping mall. Car rental is also possible on site. On the famous Promenade des Anglais, this Radisson Blu hotel features a rooftop swimming pool with solarium, a private beach, fitness center and panoramic views of the Mediterranean Sea. The Radisson Blu Hôtel Nice has elegantly decorated guest rooms equipped with air conditioning, cable TV and free Wi-Fi access. Some rooms feature a minibar, a Nespresso coffee maker and an iPod docking station. The Bleu Citron restaurant serves gourmet French cuisine. The rooftop restaurant La Terrasse serves specialties in an open-air kitchen. Guests can also enjoy cocktails on the Lobby Bar terrace. Guests have free access to the fitness room, the sauna and Turkish bath. During the high season, the hotel provides a free shuttle service connecting the hotel to the historic quarter. The hotel provides a tour desk and valet parking. Bicycle and car rental services are also available. Cannes is 19 miles away and Nice Airport can be reached in 10 minutes by car. This luxury, 4-star boutique hotel is high above the Promenade des Anglais, nestled into the Colline du Château. The hotel is 275 yards from both Cours Saleya and the harbor, and features a heated outdoor swimming pool and a terrace with sea views. A minibar, free Wi-Fi access and wired internet are provided in each air-conditioned room. Some of the rooms feature a private balcony where guests can enjoy views of the sea and have breakfast. All of the rooms have an Italian marble bathroom and elegant Mediterranean décor. Guests can also enjoy Provencal cuisine on the terrace, in the shade of the lemon trees. A buffet breakfast, including hot and cold dishes, local and organic products is prepared every morning at Hôtel La Pérouse. The 24-hour front desk has concierge services. Guests can also exercise in the on-site fitness center before enjoying a session in the sauna, hot tub or solarium. Nice Opera House is just an 8-minute walk from the hotel and Nice-Ville Train Station is 2 miles from the hotel. On the Promenade des Anglais, just 65 ft from the beach, this hotel offers sea views. Several bus routes can be found just 100 yards away and they offer direct access to the airport, train station, Monaco and Italy. Each traditional guest room comes with free Wi-Fi access and satellite TV. Guest rooms have a warm décor and a private bathroom. All rooms are serviced by an elevator and most rooms have a balcony with sea views. A continental breakfast is served every morning at Hôtel Magnan, and can be taken on the balcony with sea views. The hotel is located only a 15 minute walk from the center of town and public parking is at a location nearby. Nice-Cote d’Azur Airport is just a 5 minute drive away. Quality Hotel Flore Nice Promenade is in central Nice, a 2 minute walk from the Promenade des Anglais and the sea front. It offers stylish guest rooms with a flat-screen TV and facilities for making tea and coffee. Each air-conditioned room and suite has a refined décor designed with warm Mediterranean colors. All rooms have a private marble bathroom, and come with cable TV and free Wi-Fi access. At Quality Hotel Flore Nice Promenade, guests have the choice between a continental breakfast and a buffet breakfast, both served every morning. Breakfast can be served in the guest room or on the terrace. In addition to a 24-hour front desk, the hotel also provides a laundry and dry cleaning service. Nice Opera is less than half a mile from the hotel and Nice-Cote d’Azur Airport is 4 miles away. Public parking is available nearby. Suite Novotel Nice Aéroport Arenas is conveniently located 5 minutes from the Promenade des Anglais and Nice International Côte d'Azur Airport. It features an outdoor swimming pool, terrace bar and 24-hour snack area. The rooms at Suite Novotel feature air conditioning, a flat-screen TV and a private bathroom with a bath and walk-in shower. Each has a fridge and microwave. Buffet breakfast can be enjoyed in the comfort of the guest rooms or in the hotel's dining area while using the free Wi-Fi. Suite Novotel Nice Aéroport also offers a 24-hour reception, fully equipped fitness room, ironing facilities and free massages on Thursdays. An airport shuttle service is available 24/7 and Nice town centre is accessible via local buses. Public parking is available nearby.